Got any Star Wars facts? Let's see how much facts we can get... I'll add them to the toppost later if I don't forget it.. I'll start off with what I know! R2D2 has recently been confirmed as a returning character in Star Wars VII. Though he'll return, this unit is not like the R2D2 which is known to us so far. This one is different; it's fanmade. Lee Towersey and Oliver Steeples are the guys behind it, literally and as a matter of speech. As they got picked up throughout a Star Wars Celebration event, they will work upon a new unit which will have better improvements (on mechanics and such) and hopefully also will live up to the expectations of all the Star Wars fans out there. Initially, Harrison Ford didn't sign for The Return Of The Jedi. Lucas had written a script/scene where it would've been logical that Han Solo wouldn't return as he would've died by the carbon freezing process in between The Empire Strikes Back and The Return Of The Jedi. Harrison also requested that Han would die due to the process, but eventually Lucas declined it. Fact 3 - And Action! Have you ever wondered what the name R2D2 means? According to an encyclopedia, which dates from after Star Wars IV - A New Hope, R2D2 stands for "Second Generation Robotic Droid Series-2". However, what the actual name R2D2 means is "Reel 2, Dialog 2". This hasn't got anything to do with the Star Wars movies, but during the development of the movie American Graffiti, Walter Murc, a sound editor, asked for Reel 2, Dialog Track 2 using its abbreviation "R 2 D 2". Lucas, who fell asleep while writing the Star Wars script, woke up and overheard this. He asked for clarification and then replied that he liked the name and went back to sleep. The only 2 characters that have been seen throughout all the movies (who were the same person all along) are C3PO and R2D2. Though there are other characters that may be in all of them, due to their age, they are played by multiple people. R2D2 has also been confirmed to be in the new upcoming Star Wars, episode VII. Will C3PO join him on his continuous quest..? Fact 5 - Took the wrong exit? A pretty known sentence to all of us, though it might seem that they got lost on the way home. Throughout the first episode, we can see 3 E.T.-characters appear. This is a small easter egg towards Steven Spielberg, as Spielberg and Lucas are really good friends. Throughout the movies, there are scenes where you can actually look into Darth Vaders mask. During the editing, this has been blackened out so it's not possible to look inside (anymore). Originally, in episode VI, an army of wookiees was intended to help out on Endor. Eventually Lucas wanted to go for a smaller, furry animal instead, which we now know as the Ewoks. (Strangely enough though,) the word 'Ewok' was actually never mentioned throughout the movie. Fact 8 - The Force, you must use. Music, you shall hear? When recording the scenes between Yoda and Luke, Mark Hammil (Luke) received an earpiece at first so he'd hear the dialogue of Yoda. While using this earpiece, it turned out that when he turned his head, he actually would receive Radio 1 (which was playing The Rolling Stones singing Fool To Cry) instead of the dialogue. Eventually they dropped the earpiece and he did the scenes without Yoda's dialogue. On a sidenote; did you know that Mark did some voice-acting for e.g. The Joker in "Batman Arkham City" and as a Narrator in "Call of Duty 2"? While recording, some actors apparently enjoyed it so much that they actually made lightsabersounds themselves while fighting. Even Ewan McGregor, who plays Obi-Wan Kenobi in the first episode, was one of them. This had to fixed later in post production. As we all know, The Empire Strikes Back has a famous asteroid sequence. According to some of the SFX members who worked on this scene, one asteroid is actually a shoe and another one would be a potato. It's been said that the shoe came into play after one of the animators got tired of Lucas' continuous request on adjustments of the sequence. Aaaand we're back for more! Fact 11 - Why, Luke? Throughout the series, various characters have been 'translated' by puppeteers. Yoda, for example, was being moved by a puppeteer. Another character was Jabba The Hut. It took 10 puppeteers, using both hands, to make this possible. What a big guy.. 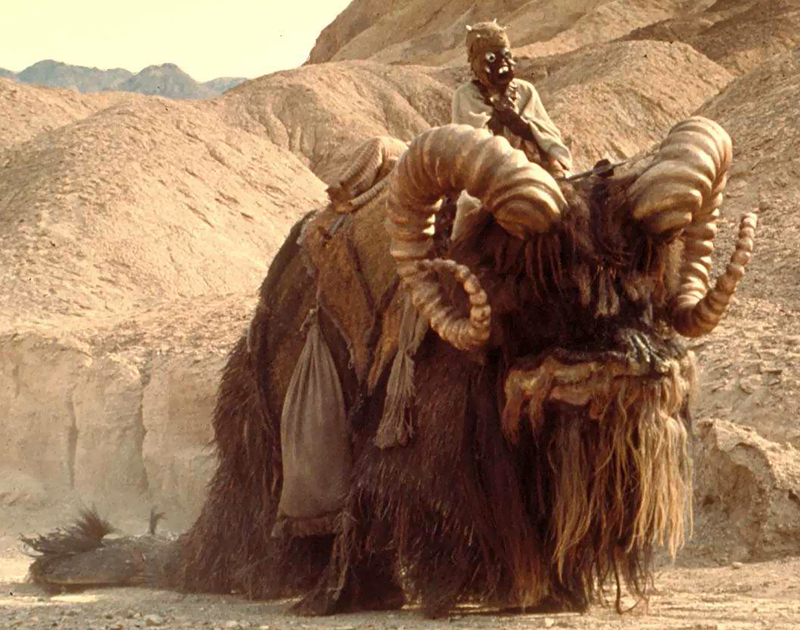 In Star Wars IV (A New Hope), there's a scene where you can see a bantha. This thing was actually not a robot or anything, it was an elephant in disguise. If you watch the movie closely at this scene, you can see the feet of the elephant. The Millenium Falcon was inspired by the shape of a hamburger with an olive on the side. I guess someone was hungry..
As Darth Vader's breathing was achieved by using a scuba regulator. To portray Darth Vader, they used three different actors: James Earl Jones for the voice, Sebastian Shaw for the face, and David Prowse for his body. Did you know that Lucas got this name from a movie he made earlier? In THX 1138 there's a scene where the hero steals a car with a police radio and the voice coming through says 'I ran over a wookiee back there on the expressway'. Lucas liked this made up word so much that he wrote it down and eventually it became the known species in Star Wars. As Lucas was afraid that the twist in the story (where Vader reveals he's Luke's father) would leak to the press, he actually filmed Vader saying "Obi-Wan killed your father", which was later dubbed over. Only a handful of people back then knew the truth. Fact 19 - Nah. Nah. Faaaaamily Guuuuuuuuuuuuy! Did you know that, during production, The Return Of The Jedi was filmed under a different name to avoid publicity. That name was "Blue Harvest: Horror Beyond Imagination". Now you know where the name of the Star Wars episode in Family Guy comes from. Bonus: Blue Harvest was also a bogus title based on the novel Red Harvest, which was said to be an influence for Akira Kurosawa’s Yojimbo, which was cited as an influence for Star Wars. It all fits..
- Mace Windu orders a clone pilot to land in an assembly area. The pilot's designation is 1138.